Are you a leader who wants to develop a mindset practice that enables you to break through any limitation in order to live an extraordinary life? Are you tired of feeling stressed out and you’re ready to feel super-charged instead? Are you tired of playing small and ready to live at your fullest potential in every area of your life – but don’t know how? The top leaders we’ve worked with in over 65 countries have found their answers to these questions, and more, using our proven strategy for how to live fearlessly in every area of your life. Visit WorldBlu.com to access complete show notes and our free training now. Hi everyone! This is Traci and today we are going to explore the 5 steps to living fearlessly in every area of your life! Are you a highly motivated individual who wants to develop a mindset practice that enables you to break through ANY limitation in order to live a fearless and extraordinary life? Are you stick of feeling stressed out and you’re desperately ready to feel SUPER-charged instead? Are you DONE with feeling tired, limited, and held back from achieving the FULL results you really want out of life? If ANY of this sounds like you, then you’re in the right place! Do you feel stuck in life and not moving forward, but have no idea how to get unstuck? Do you have unfulfilled dreams pilling up, but you don’t know how to take the first step to achieving them? Are you tired of feeling trapped by bad decisions, but have no idea how to make better ones? Do you feel stressed out and anxious ALL the time, but you have no idea how to let it go? Do you LONG for a greater sense of peace and calm in your life, but have no idea how to achieve it? Have you spent hundreds or even thousands of dollars and many years on self-improvement seminars, books or programs only to feel that you’re right where you started? Most importantly, are you tired of playing small and ready to live at your fullest potential in every area of your life – but don’t know how? The top leaders I’ve worked with in over 65 countries have found THEIR answers to these questions, and MORE, using our PROVEN 5-step strategy that I’m going to share with you today. They’ve experienced real transformation so that they can feel SUPER-charged, live stress-free, and achieve the results they want by cultivating a MINDSET of freedom rather than fear and control. The problem is that most of the time the way we try to destress in order to have a clearer mindset is through unhealthy eating, drinking or recreational habits that don’t address the REAL problem. Or we think that simply reading a book, watching yet another an online talk, or taking that one-day workshop will instantly teach us how to handle our fears and stress and make life more bearable. Even WORSE, I’ve meet so many people who think that simply pretending, ignoring, or masking their fears means that miraculously they aren’t impacted by them, and no one else is, either. While it’s good to keep learning through books and talks and workshops, and even I have my favorite thing I love to eat when I’m stressed out (dark chocolate with sea salt, but don’t tell anybody! If you want to know my favorite brand, message me! ), these activities are either just about information or about giving us a temporary Band-Aids, so we can numb ourselves, emotionally check-out and not feel the fear – or address it. Are you someone who is even AWARE of how much fear is creating problems in your life, or have you buried the sense of fear that we all feel from time to time, down so deep that you’re completely emotionally disconnected from yourself and wouldn't even know where to start? If any of this sounds like you, I invite you to keep listening because today I want to talk with you about 5 steps to living fearlessly in every area of your life so that you can overcome any limitation, make better decisions, reclaim your worth, and live an extraordinary life. There are 5 shifts high-achieving people understand for how to have a mindset that enables them to break through any limitation in order to live a fearless and extraordinary life. Understand a COMPLETE and proven practice for living fearlessly in every area of your life. Know the #1 starting place most people completely overlook that will help you determine the overall direction of your life. Know the #1 question to ask to TRANSFORM your life — and help others do the same as well. Uncover the one thing most people think is key to motivation — but TOTALLY isn’t. And you’ll know the core thing you MUST do in order to sustain an optimal mindset of success throughout your entire life.
. . . By making these five shifts I’m going to teach you today, you will develop a mindset practice proven to empower you to overcome any limitation, make better decisions, reclaim your worth, and live a breakthrough life. Now let me take a moment and tell you how I discovered these 5 shifts. My team and I have been doing leadership and mindset development training for over twenty years, and we have impacted thousands of individuals and leaders in all different industries all over the world by teaching them how to cultivate a mindset of freedom rather than fear and control. We’ve worked with individuals at widely admired brands such as Zappos, WD-40, Hulu, Pandora, DaVita, Menlo Innovations, MindValley, and hundreds more organizations globally. I’ve taught these ideas at Harvard, Yale, the US Naval Academy, TEDx, South by Southwest, the CIA and dozens more locations around the world. Along the way, I realized that there was a HUGE difference between those individuals who were breaking through limitations and making great choices, advancing their careers, building meaningful relationships, and living a life of confidence and joy -- and those who were NOT. I started to compare what those successful individuals were doing and what others weren’t doing, and I realized that there were 5 shifts the TOP leaders were doing in their personal AND professional lives to cultivate a mindset of freedom rather than fear. So, I started sharing the secrets I was discovering with OUR clients and they started seeing unbelievable results as well. So, the bottom-line line is this . . . There are 5 key shifts you MUST make in order to develop a mindset that allows you to live fearlessly in EVERY area of your life. The first shift is to understand that your mindset determines the direction of your life. Your mindset, more than anything else, determines the direction of your life. However, most people don’t understand this. You can INTENTIONALLY choose how you want to orient your mindset each and every day, and by doing this, you will shape the direction of your life either positively or negatively. Whether you are aware of it or not, your mindset impacts the way you behave and treat your friends, family and colleagues. Your actions toward others ripples out to impact our communities, which ultimately ripples out to impact our world. 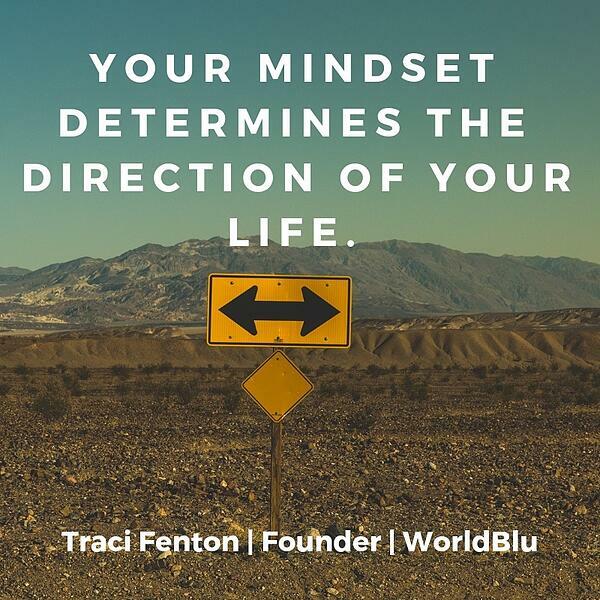 Your mindset, more than any other factor, will shape the direction of your life. So what kind of mindset do you want to cultivate? That’s why it’s so important to intentionally choose your mindset so you can intentionally set the direction of your life. Now, let’s take a look at the second shift. . . The second shift is this – Freedom, not fear, cultivates the optimal mindset for success in EVERY area of your life. 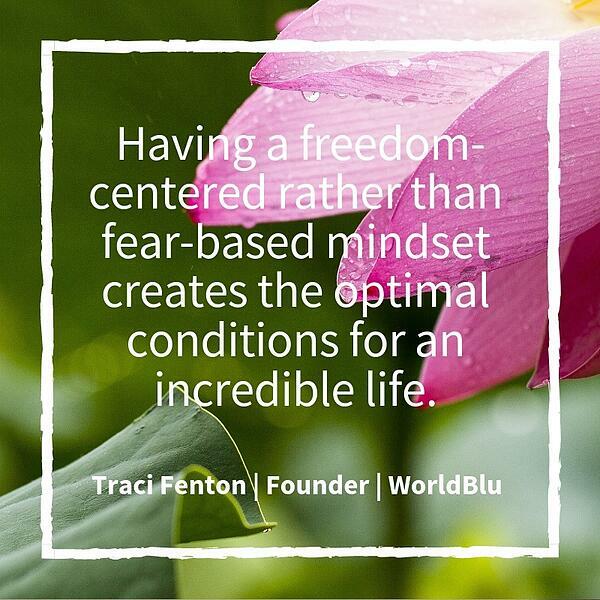 Having a freedom-centered rather than fear-based mindset creates the optimal conditions for an incredible life AND being a positive force for good in the world. However, fear – and I’m not talking here about the kind of fear that alerts you to danger, I’m talking about the kind of fear that LIMITS you from living your fullest potential – is the biggest inhibitor to living a truly extraordinary life. I believe you have a right to live free of fear. But the problem is that most of the time, we are operating in a mindset of fear and we don’t even realize it! The average person thinks around 60,000 thoughts a day. 95% of those thoughts are the EXACT same thoughts they had the day before. And a whopping 80% of those thoughts are negative and fear-based! The biggest source of almost ALL our problems is a 4-letter word that starts with an “f” – and that’s FEAR. Fear is the REAL problem you’re dealing with, and freedom, not fear and control, is proven to cultivate the optimal mindset for success. The problem is that we end up wasting thousands of dollars and hundreds of hours of our time with Band-Aid solutions and one-off trainings that don’t develop a freedom-centered mindset because they don’t address the #1 problem that holds most people back – and that’s knowing how to identify AND handle fear. What do I mean by fear? Well, let’s take a look at some of the SYMPTOMS of fear in our lives. . .
Have any of you felt any of those things? I know I have! Most of the time, we’re operating in fear and we don’t even realize it. But to cultivate a world-class mindset so that we can operate fearlessly in every area of our lives personally and professionally, we have to learn how to think and then ACT from a mindset of freedom instead. Live a life of positive impact . . . And SO much more! This is why it’s so important to understand that freedom, not fear, cultivates the optimal mindset for success in every area of your life. The Power Question was something I was asked by a new mentor of mine when I was living in Washington, DC in my mid-20s. I was a full-time graduate student, working for the Nasdaq Stock Market Foundation while starting WorldBlu, traveling, and just insanely busy. One day I called my mentor and spilled my heart out to her, sharing all my problems and concerns and probably shedding a few tears in the process. I paused. “What?” I asked her again. In an instant, with just that ONE question, she had pulled the rug out from under all my fears and concerns. I hadn’t realized I was functioning in fear – I just thought I had a bunch of problems – but her question showed me that at the root of ALL of the issues I was dealing with was FEAR. Not only that, by asking the question, “What would I do if I weren’t afraid?” I suddenly knew what I WOULD do! The weight I’d been carrying just lifted off of me, I felt refresh, energized, and super-charged. The fog had lifted – I knew what I needed to do, and I did it! And the Power Question has been a part of my life ever since. The Power Question, which is – What would you do if you weren’t afraid? – is a life-transforming question. You can apply it to ANY challenge, opportunity, or decision you need to make, and it will immediately SHIFT your thinking, taking you OUT of fear and control and INTO freedom and possibility, with clear answers and an empowered sense of how to move forward. I call it, “The Power Question,” because when we are in a state of fear, we are NOT in our power. When we become aware of the fear that is impacting us and use The Power Question to overcome it, then we are back IN our true power. I’ve also developed a 5-step process called The Power Question Practice, a daily practice which expands on the one Power Question. While I don’t have time to teach you the entire 5-step process in this podcast, we do teach it in our Power Question course at the WorldBlu Academy teaching you exactly how to RECOGNIZE and then uncover fear in your thinking in order to breakthrough to the next level in your life. The problem is that most of the time we’re handling NOT fear itself, but the SYMPTOMS of fear, and we’re doing it in highly ineffective ways. Or go it alone. Perhaps they acknowledge they have fear but they don’t reach out to anyone else to get support in overcoming it. Have you experienced any of these behaviors as you’ve worked through stress, anxiety, concern or worry – which are all other names for fear – in your own life? I know I have! Now while these ways of dealing with fear might temporarily MANAGE the fear, they don’t help you get a greater sense of clarity, peace or a way forward because they don’t teach you HOW to overcome the fear. The bottom-line is this -- The old way of handling fear -- which is to basically never look at it and NOT handle it at all -- does not teach you HOW to overcome fear, ultimately keeping you trapped in a cycle of bad decisions, more stress, and unrealized potential. In order to have a mindset transformation, you have to have a PROVEN daily practice that teaches you how to become aware of the fear in your thinking and how to overcome it. You get there by looking at the challenge you are facing and asking yourself The Power Question – What would you do, how would you handle this problem, what conversation would you need to have, what action would you need to take -- if you weren’t afraid? It is NOT about masking fear, denying it, or running away from it. Admitting that you have fear – which we all have at times– is NOT a weakness, it is simply an opportunity to grow. And that’s what this one powerful question gives us – the opportunity to grow. “Traci has changed the world with The Power Question, improving the lives of thousands of people from over 100 countries worldwide. 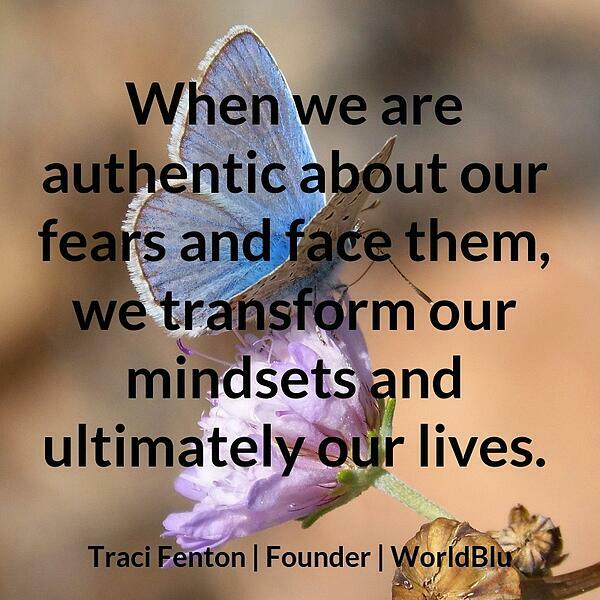 When we are authentic about our fears and face them, we transform our mindsets and ultimately our lives. Just image what impact for good you could have on your workplace, your family, your health, your finances and the WORLD if you weren’t afraid? Use our proven practice – The Power Question – What would you do if you weren’t afraid? By embracing these shifts, you will TRANSFORM your mindset AND your life. You will learn how to break through any limitation so that you can cultivate deep and meaningful relationships with friends and family, advance your career, go for that dream, inspire your kids, love your life, and achieve extraordinary results you never thought possible. Now, let’s take a look at the 4th Shift! The 4th shift is this -- Fear is NOT a strategy for success. However, many people THINK that it is. Motivator. I know a lot of people who like to say, “But I use fear to motivate myself and if I didn’t I wouldn’t get anything done! I also have top leaders and managers often confess to me that they like to use fear to motivate their employees. First of all, research proves that when we are in a state of fear the peripheries of our brain shut down and we get tunnel vision. We don’t see the full range of options available to us and are therefore less creative, make poor decisions and basically become dumber. Fear should not be what motivates us – our PURPOSE should be what motivate us, and if you don’t know your purpose for your life, check out our leadership transformation course and we can help you discover it! The point is that fear is not a constructive motivator ever. Your purpose, however, is. Secondly, fear is not a friend. Again, a lot of people think that you can use fear as a friend or a guide to point you in the right direction. While I agree that sometimes the very thing you need to do in your life might come with some fear, and it usually does, I don’t think you need to make it your friend. The goal isn’t to HANG out with fear – the goal is to first of all RECOGNIZE it so that it loses its grip on your thinking and then to OVERCOME it. Lastly, fear is not an effective manager of your life. People like to say – “navigate your life by your fears!” but I believe in navigating your life by your purpose. If fear is a manager, then it’s a BAD one, and no one likes to work for a really bad, fear-based manager -- I think most people would prefer to work with a freedom-centered leader! So, stop thinking of fear as a friend and learn how to recognize it and OVERCOME it because that’s the best strategy for success. The 5th and final shift is this. . . . The most effective way to overcome fear is NOT about ignoring fear or about seeking more INFORMATION through online talks, workshops or speeches. It IS about experiencing real and lasting TRANSFORMATION that truly remakes you from the inside out. This happens with a daily practice that makes you aware of the fear in your thinking and gives you the tools for overcoming it, so that you can live fearlessly in every area of your life. At the end of the day, you have to ask yourself, what’s it worth to you to know how to handle fear FOR THE REST OF YOUR LIFE? You deserve to have a mindset practice that is proven to empower you to overcome any limitation, make better decisions, reclaim your worth, and live an extraordinary life. More than that, if you lead a team, division, start-up organization or Fortune 500 company, what would it be worth for you to have the tools to handle your colleagues fear as well? Here at the WorldBlu Academy, we’ve had leaders from over 65 countries worldwide participate in our 8-week Power Question Practice transformational course, delivered through our blended and experiential learning approach, supported with coaching and a global tribe of fellow individuals committed to living their lives in freedom rather than fear. Leaders we’ve worked with worldwide have consistently found our course to be one of the most transformational and substantial mindset development programs they’ve ever experienced. The Power Question Practice course has empowered individuals all over the world to think and lead from a place of freedom rather than fear and control, transforming themselves, their teams, their organizations – even their families! -- and our world for the better. Remember, trying to develop a world-class mindset without a PROVEN PRACTICE to get you there is highly ineffective and disempowering, wasting your time and money. Find the BEST mindset coach and course out there and spend what it takes to work with them to get the results you deserve. This is how to sustain a peak mindset of freedom and success rather than fear and failure throughout your ENTIRE life. And the key thing you MUST do in order to sustain an optimal mindset of success throughout your entire life. We explored the 5 shifts to living fearlessly in every area of your life by having a mindset practice proven to empower you to overcome any limitation, make better decisions, reclaim your worth, and live an extraordinary life. Using our proven practice – The Power Question – What would you do if you weren’t afraid? And to stop trying to figure this out on your own. Invest in a transformational mindset course and coach. Practicing these five shifts are enough to propel you toward getting OUT of the fear-fog to feel super-charged, live stress-free and achieve the results YOU want out of life by cultivating a mindset of FREEDOM rather than fear. The Power Question has transformed my life and allowed me to achieve my dreams and I know it can for you, too! With this mindset practice, you WILL transform the way you interact with and lead your team or organization AND the way you engage with your family and friends, ultimately transforming our world for the better.